Wooden planing forms are easy to make. Do you worry that your plane will slice the surface of the wooden form? No, no, using a grooved sole plane protects the surface of the forms. Another benefit of wooden forms is that the plane blade stays sharper than when using it on steel PF because the grooved sole prevents the plane blade from touching the surface of the PF. First, I use a normal (non grooved) block plane to eliminate much of the thickness of strips, nearly down to the forms. Then I use the grooved plane to plane the strips all the way down to the PF surface. This way, the plane blade stays sharp two or three times longer. I can plane one or two rods without re-sharpening the blade. I used very hard oak boards shown in the photo below. Size is 24mm wide, 32mm high, 1530 mm long. There are several ways to make wooden forms. The method described here was introduced by Tony Young. His method uses a set of barrel nuts and cap bolts to open, close, and fix the width of the form. 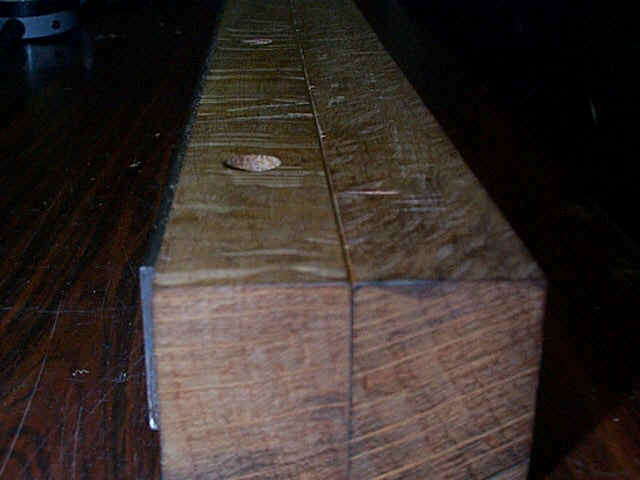 If you prefer push-pull forms, you can use "nail nuts" as shown below on each side of the wood. 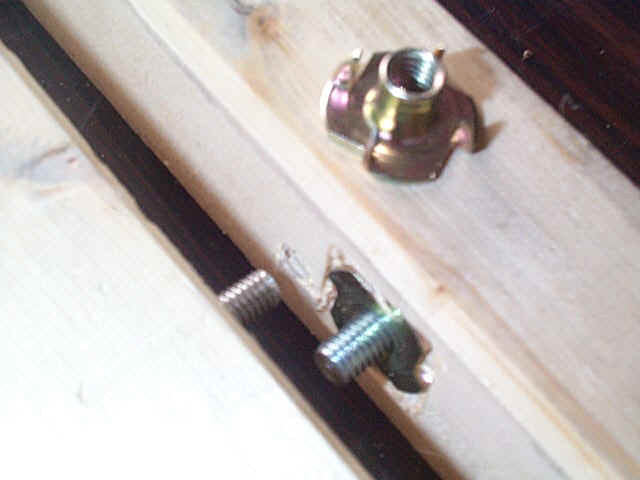 For the pull bolt, the nut is attached outside the wood and for the push bolts, inside the wood (on both sides of the same side). And where the push screw hits (on other side of forms) affix a big head screw to absorb the force of the push bolt. Because this nut is fairly thick, you need to inlet the wood where the nut hits with a chisel. 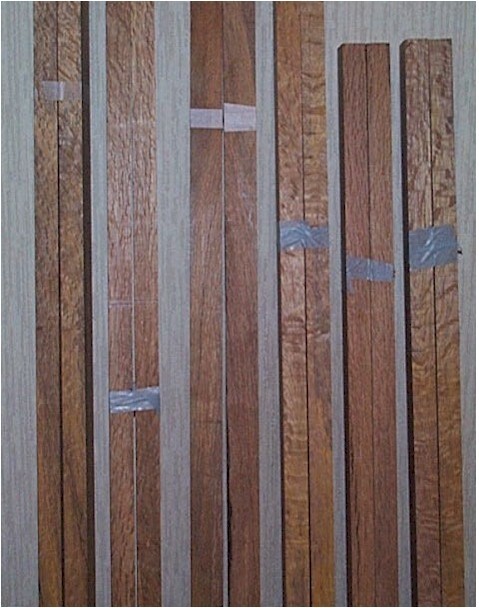 You must have precise alignment of two boards when the form is closed. When the nut is tapped in with a hammer, be careful that the nut's hole and hole in the wood align to each other perfectly. Steel plate covers the head of cap bolts and prevent the bolts from coming off. Hex wrench fits into the hole of the steel plate and turns the bolt. Steel plate is tightly screwed to the oak boards. Only one side of steel plate has adjustment holes for hex wrench. The other side also has a steel plate screwed to the wood. 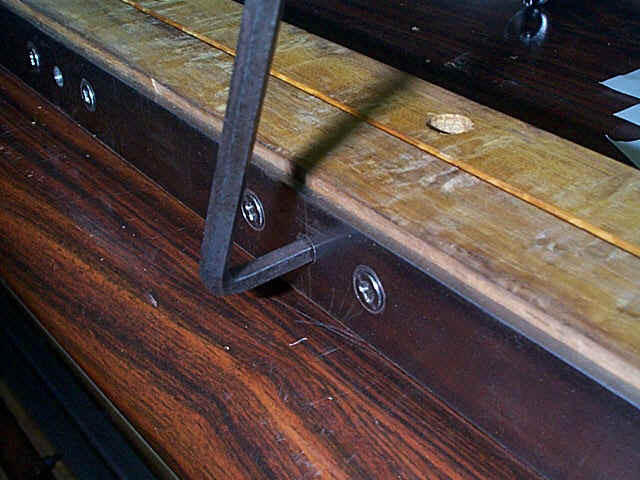 Having a steel plate on both sides of form keeps the bending of the two wood bars balanced. Holes on the top surface do not disturb the planing since we use grooved sole plane. V channel can be cut to 0.6mm depth at the shallowest part. If you cut too much, plane the surface of the wood again with your block plane. I made a very simple tool to cut the V groove. The blade is lathe screw cutting bit with a 60 degree point. It does a good job of making the groove into a very precise 60 degree V shape. There are two ways to make V groove. One way is to file the groove using triangle shaped file while roughly shaping the v groove. 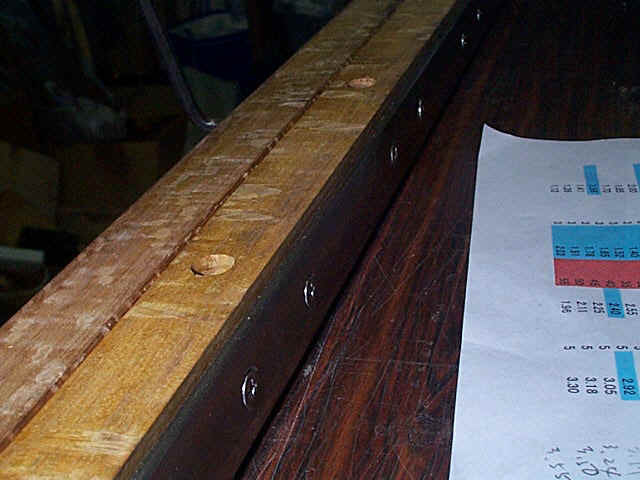 Another way is to attach two wooden guide plates on each side of the form with the desired slope. The 60 degree lathe threading tool moves along the slope of the guide plates. This tool is made by sandwiching the lathe bit between two blocks. Another wood block holds the bit between these two. I made barrel nuts from 10mm round brass stock using power threading tool and tap for M6 bolt. M6 bolts and nuts are usually threaded at the pitch of 0.5mm in metric. With a smaller pitch 0.2mm for example, it is easier to adjust the width (that is depth) precisely. To work this way, we need to find a smaller pitch bolt and nut, or thread them ourselves by using tap and dies. The following picture shows you how the cap bolt and barrel nut work together. The first picture show a side view, the lower picture a top view. d: 10mm dia round wood bar or metal bar for dowel pins. l: screws for tightening steel plates, 2 x # of cap bolts x two sides. For material "e" above, drill the guide hole at the center and then tap M6 thread for the cap bolt. It is easier to drill the hole on the side of round surface if you file the side surface flat a little first. First, draw the center line on the side surface of wood, then mark 5" intervals. Extend the 5" mark toward the top/bottom surface and mark 5" intervals on the top/bottom surfaces also. 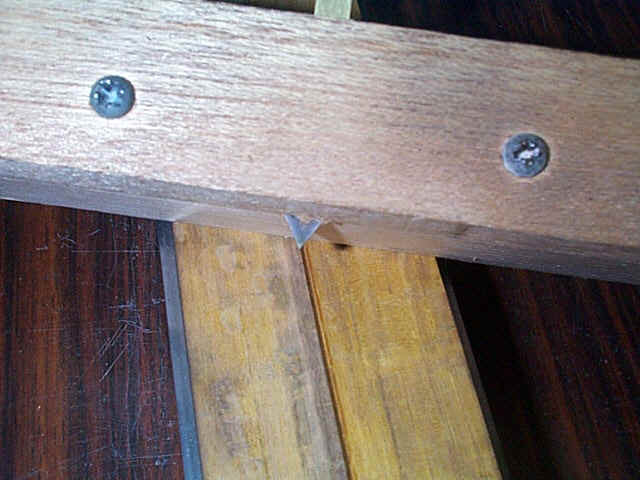 Clamp the two woods tightly and drill the 6mm holes at the 5" interval marks on the sides. This must be done on the drill press or mill. The hole should go through the two oak boards at the exact same place and should be exactly 90 degree to each side. Keep the clamps on until setting the barrel nuts and cap bolts is completed. Next, measure the height and the diameter of the head of the cap bolt. This is to determine how far the cap bolt heads must be sunk into the wood. 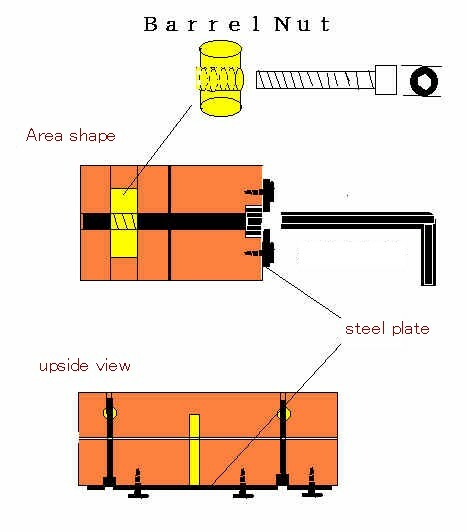 The steel plate presses the head of the cap bolt from the outer side. Let's call this side of wood as Side A. A flat spade drill might be useful to make the countersink..
At the center of the 5" mark, add another mark to drill 10mm holes for dowel pins. Like the cap bolt's hole, this hole should be drilled carefully and straight. Second side of wood is Side B. We will drill 10mm vertical holes on the upper surface of Side B wood. This hole also must be placed exactly in line with cap bolt holes. Otherwise, the cap bolts will not get thread into the barrel nuts. Insert all the barrel nuts and cap bolts. Check to see if the top of the cap bolts are flat to the side surface of Side A wood. If not, adjust here. At the center of 25mm width of two steel plates, mark the center line first and mark 5" intervals on Side A steel plate. Adjust with the oak boards at each end. We are going to drill a hole which will accept hex wrench for the cap bolt, but the cap bolt head should fit through the hole. Measure the cap bolt head prior to this. We are also going to drill two small holes beside the hole for the hex wrench. This fixes the steel plate to the wood. Measure the diameter of the screw which you are going to use. When turning clockwise (when tightening the form), the head of the cap bolt presses the Side A wood. When loosening the form, the cap bolt is turned counter clock and the head of the cap bolt presses the inside of the covering steel plate. The strength of the screws fixing the plate to the board should be strong enough to prevent this from pulling the plate off of the board. For Side B steel plate, copy the placement of the screw holes in Side A steel plate, and drill the screw holes. Insert dowel pins prior to fixing steel plates on woods. Fix two steel plates on boards by the screws. For Side A, make sure the hex wrench can go through the holes. Here the wooden form is almost finished. After tightening all the cap bolts, we must make sure both of the planing surfaces are flat. To do this we will block plane the surface prior to making v groove. 1. Triangle area shape file. You may make a beautiful V groove by scraping the groove with the lathe threading bit after filing the groove with triangular file.